23 decibels signal to noise rating. Water proof and sound reducing. BioEars Earplugs are designed to Only Cover the ear opening and should bediscarded if plug becomes dirty or is no longersticky. Roll and reshape with clean hands before each use. Do not exceed 3 uses. Easy Removal Remove earplugs by pressing forward behind the ear and then pulling down on the earlobe repeat the sequence until seal is broken then proceed to carefully pull earplug away from ear opening. Make sure hands are clean and dry. Shape entire plug into ball.<br>Warning: Do not split plugs into smaller pieces. Small plugs can become lodged in ear canal causing harm to the ear.<br><br>Make sure area around the ear opening is clean and dry. Place plug over ear opening and gently flatten to form a seal.<br>Avoid loose hair contacting plug, if plug becomes stuck in hair soak affected pieces of hair with a hot cloth and the plug will loosen.<br><br>DO NOT push plug into ear canal. 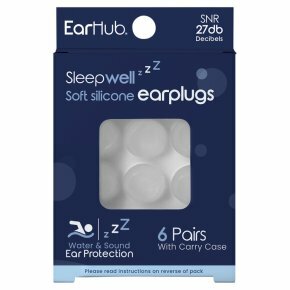 Only ear opening!<br>Earplugs may be difficult to remove if pushed into ear.<br><br>If earplug is swallowed: Earplug material is non-toxic silicone putty and may contain additional non-toxic materials. Earplugs will pass through digestive tract and be expelled in normal fashion.<br><br>Warning! If an earplug has been pushed into the ear canal, contrary to printed directions and initial removal has left earplug pieces in the ear canal, DO NOT try to remove any remaining earplug pieces with a tweezer, cotton swab, or other utensils. This could push earplug pieces further into the ear canal and cause significant discomfort. See an Ear, Nose and Throat Doctor, only they have required equipment to remove earplug material from the ear. Plug pieces remaining in ear canal for afew days will cause no harm.<br><br>Warning! Children should always be supervised by an adult. Keep away from infants or small children because, while non-toxic, swallowing an earplug may interfere with breathing which could result in serious injury or death. Never use for scuba diving or swimming at depths of more than 10 feet (3 meters) of water.